(VEN) - In an interview with Vietnam Economic New’s Lan Anh, Commercial Counselor in Brazil Pham Ba Uong (Vietnamese trade offices in Brazil, Colombia and Bolivia) said there was still much room for Vietnam’s exports to Brazil, especially the high value-added goods. (VEN) - At the seventh meeting of the UK-Vietnam Joint Economic and Trade Committee (JETCO 7) held on January 7 in Hanoi, Deputy Minister of Industry and Trade Ho Thi Kim Thoa said that the UK-Vietnam bilateral trade reached US$4.3 billion in 2013 compared with the annual target of US$4 billion. 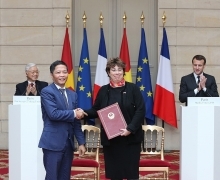 (VEN) - Vietnamese Deputy Minister of Industry and Trade Ho Thi Kim Thoa and Guinea-Bissau's Secretary of State for Trade, Industry and Development of National Products Ibraima Djalo recently signed a memorandum of understanding (MoU) in Hanoi on cooperation between the two countries in the field of trade and industry. This is expected to be an important lever boosting Vietnamese business penetration into the West African market. Hanoi and the Lao province of Luang Prabang will promote cooperation in education and training, tourism and conservation, and agricultural production. (VEN) - The 2012 APEC Summit in Vladivostok, Russia ended in success.